Be the first to hear about their new releases and deals. Download the Booksprout app and search for Jade Jones today! Jade Jones discovered her passion for creative writing in elementary school. Born in 1989, she began writing short stories and poetry as an outlet. Later on, as a teen, she led a troubled life which later resulted in her becoming a ward of the court. Jade fell in love with the art and used storytelling as a means of venting during her tumultuous times. Aging out of the system two years later, she was thrust into the dismal world of homelessness. Desperate, and with limited income, Jade began dancing full time at the tender age of eighteen. It wasn't until Fall of 2008 when she finally caught her break after being accepted into Cleveland State University. There, Jade lived on campus and majored in Film and Television. 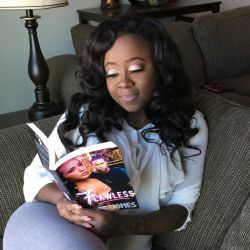 Now, six years later, she flourishes from her childhood dream of becoming a bestselling author. Since then she has written the best-selling "Cameron" series. Quite suitably, she uses her life's experiences to create captivating characters and story lines. Jade currently resides in Atlanta, Georgia. With no children, she spends her leisure shopping and traveling. She says that seeing new faces, meeting new people, and experiencing diverse cultures fuels her creativity. The stories are generated in her heart, the craft is practiced in her mind, and she expresses her passion through ink.